Edward Muybridge’s images of horses in motion answered tycoon Leland Stanford’s (right) question: Does a galloping horse ever lift all four hooves off the ground at the same time? Leland Stanford — the richest man west of the Mississippi, the Croesus who would inspire Frank Norris’s anti-monopoly novel “The Octopus” — invited San Francisco’s elite to his Nob Hill mansion on Jan. 16, 1880. What his guests saw was something the public had never seen before; it shocked and thrilled them — and later the world. 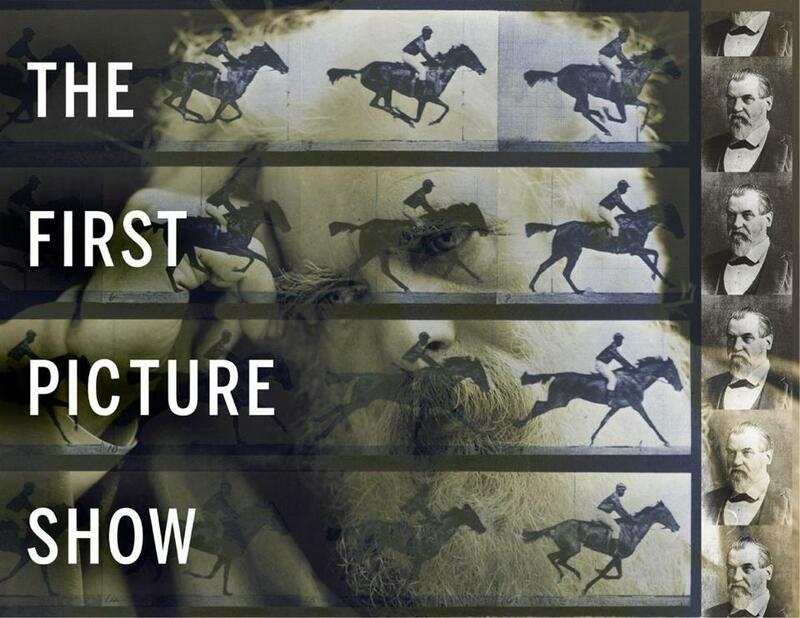 For Edward Muybridge’s moving pictures of a horse in motion displayed on a screen would usher in not only the movies but what author Edward Ball views as the age of visual media. Photographer Muybridge and railroad tycoon Stanford, a bohemian artist and a straitlaced patron, partnered in a revolution that neither had foreseen. It all began with a simple question: Did a galloping horse ever lift all four hooves off the ground at once? Yes, a blurry Muybridge photograph first demonstrated, followed by the more sensational evidence of his movie prototype a few years later. In “The Inventor and the Tycoon,” Ball, author of the National Book Award-winning “Slaves in the Family,” has brilliantly fused the stories of these two larger-than-life figures into a single glittering object: part social-cultural history, part melodrama, part chronicle of American self-invention. That Muybridge profited little from his genius, that Stanford’s curiosity grew out of his fascination with horses and indifference to Muybridge’s notoriety makes their story all the more intriguing. The photographer became notorious in 1876 after shooting and killing his wife’s lover in cold blood. In part, the vigor of Ball’s narration is due to tease. Early on, for instance, he offers a chapter on the murder, without revealing a motive. Only after several chapters on other topics, do we witness the trial. And only many pages after that do we learn the verdict. But these cliffhangers, which really do make us pant for more, are only part of the author’s sleight-of-hand. Part one slides backwards in time from 1880 to the 1860s, tracing the period when Stanford builds his fortune and Muybridge establishes himself, in fits and starts, as a photographer. Part two skips around from the 1870s to the 1830s (to Stanford’s youth), to the trial in 1876, back again to the 1830s (to Muybridge’s early years), before landing securely in the 1850s and 1860s. The more buttoned-down part three follows a straightforward path from the 1870s to Muybridge’s death in 1904. 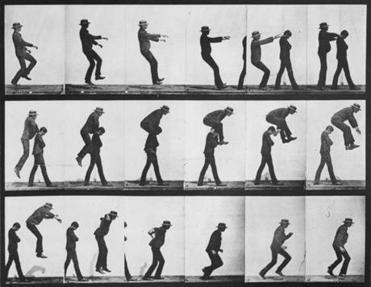 A series of images showing the various positions of a man leap-frogging over the shoulders of another. Ball, who seems to sense that all this is a bit dizzying for the reader, is forced to repeat key facts he’s already mentioned. Jumbled chronology may have had no more ardent champion since Kurt Vonnegut or Quentin Tarantino. However “cinematic” — appropriately so for the father of the movies — the technique in this context often feels over the top and needlessly confusing. Still, one gallops through this book with undiminished ardor, primarily because Muybridge was such an odd duck. While sporting an English accent — in fact, he hailed from a village outside London — he dressed like a hobo and smoked a corncob pipe. He changed the spelling of his first and last names five times, for a while calling himself simply Helios, the Greek name for the sun god. He married Flora Downs, a woman less than half his age. Before emerging as San Francisco’s best and most flamboyant photographer, he had failed at bookselling, inventing, and banking. By contrast, Stanford’s career is already part of our historical consciousness. He headed the company, fueled by government largesse and plenty of bribes, that built the western half of the transcontinental railroad, and served as California’s governor and a US senator. Yet not many are aware of his roots as the son of an upstate New York tavern keeper, or his California beginnings as a Gold-Rush town grocer. Inventor and tycoon met when the latter sought a photographer to record the majesty of his first mansion in Sacramento. What sealed their bond, however, was a passion for gadgets and horses. Stanford bought a 7,000-acre farm south of San Francisco, calling it Palo Alto (“tall tree,” in Spanish) for his trotters. A stud farm and training ground for racing, it would also become Muybridge’s laboratory (and future home of Stanford University). What adds immeasurably to this book’s many pleasures are the dozens of photographs illustrating Muybridge’s evolving art — Yosemite’s waterfalls, Alaska’s Tlingit tribesmen, San Francisco’s cityscapes, Stanford’s railroad, and, yes, horse after horse, walking, trotting, galloping, unmistakably bearing the banner of the future. Dan Cryer is author of “Being Alive and Having to Die: The Spiritual Odyssey of Forrest Church.” He can be reached at www.dancryer.org.